Since Tuesday was a day off, I took advantage of my time to visit Liquidation World, a deep-discount department store, and the MacKenzie Gallery, which is the official cultural storehouse for the province. In between I refilled my printer cartridge (which included a free explanation of the construction of an HP printer cartridge), got covered in worm threads (yech) and watched a crow drink from a puddle. If I learned one thing from my expedition, it was this: crows are really thirsty. They don't care if they have to get their water from a big pothole, they'll just wade in up to those funny knees of theirs and go for it. Their perseverance in the face of so many natural drinking disadvantages – beaks, no hands, no water tumblers – serve as a lesson to all us. At any rate, they show us that it's better to drink from a puddle in the road than spend too much time at Liquidation World. There's a phrase that my friend Craig uses to describe the revulsion and prickly unease that places like Liquidation World or Dollarama engender. Translated directly from idiomatic Spanish, the phrase reads: It gives me thing. Liquidation World on a Tuesday morning may have plenty of goods for 75% off the sticker price, but it gives plenty of thing for free. When I walked in the place was nearly empty, with casually dressed staff appearing to outnumber customers. The few shoppers wandering the aisles looked confused at having ended up there. I watched them pick up floral-scented candles and cans of discontinued dog food, clearly hoping that one of these items would justify their wandering feet. Liquidation World is best described as Canada's department store of failure. If your genius product bombs in the marketplace, if your warehouse catches fire, if your heart gives out or your cash flow simply drains away down the sink of bankruptcy, Liquidation World will swoop in and carry off the swag to its high cliffside nest network of retail outlets. Do you want your chipboard- with-maple-veneer armoir slightly water damaged? Urgently need a palette rack of brand-name candy that failed its test market run? Then you need Liquidation World. Or you need 24 boxes of 'Will o' the Crisp' for twenty bucks. Their website claims that shoppers will enjoy the fun of discovering new and unexpected goods, but I can't say it was much fun to discover a bottle of 'low-calorie' ketchup that seemed to have a half inch layer of oil floating on its surface (to me this crosses the condiment-salad dressing barrier). Ditto for the jars of something called 'burrito starter,' which made me think of some kind of weird burrito engine. Take your burrito for a test drive! No money down! A few minutes of searching turned up some items that I considered picking up as irritating novelty gifts. 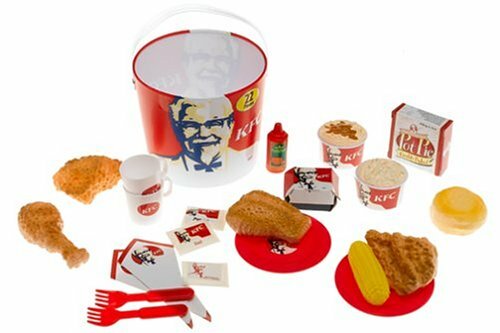 Most Dubious Toy Award definitely went to the nine-piece, life-size, all-gross KFC Play Meal, which comprised several pieces of plastic chicken in a plastic bucket with plastic fries and coleslaw (also plastic). There were no demo models available to allow me to handle the individual pieces and judge the exact amount of fun I could wring out of each, but taken collectively, it was hard to imagine children incorporating it into their imaginative lives. Or maybe there's a High Cholesterol Sally doll out there. I also found a beard trimmer whose avowed purpose, according to the package, was 'bathroom art'. To help sell the concept there was a photo of a guy with a well-trimmed beard, a shock of Thomas Dolby hair and an expression that suggested a thyroid condition. Altogether the product was pitched squarely at the 1986 demographic, missing its target by a matter of mere decades. I could see that Liquidation World probably had genuine deals every so often, worthwhile and useful products that had washed up on reduction's shores, but to find them would require a certain level of commitment, a willingness to go the distance, to patrol the stacks on a regular basis, train your eye to block out the crap, befriend the cashiers to get tips on a juicy estate sale or bankruptcy. Given the amount of florescent sixty-cycle thing I was getting from a twenty-minute visit, I knew I could never manage such a task. On the way out I picked up a package of Achoo designer tissues, the world's most self-explanatory paper product. I knew Schmutzie would get a kick out of them. Next: a visit to high culture at the MacKenzie Gallery.